1. Looking at this new promo pic while simultaneously listening to this tune. 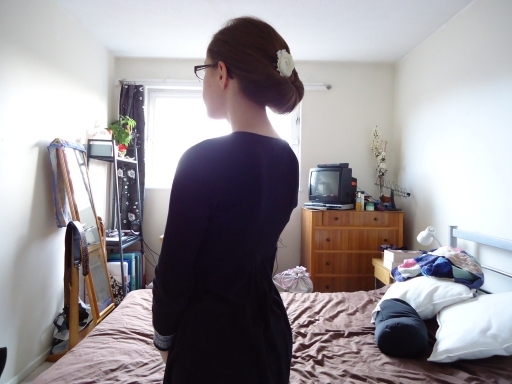 So, I tried to go for this Downton Abbey inspired hairstyle today. It was not as easy as the last one. I managed to get the front looking ok, although I don't have rats so it wasn't that poofy. 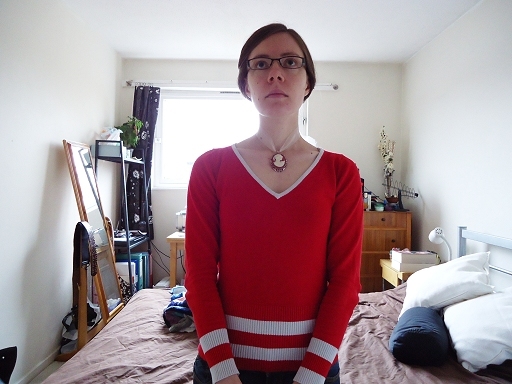 But the back was well hard (I have a feeling they didn't have to contend with layers back in the day). 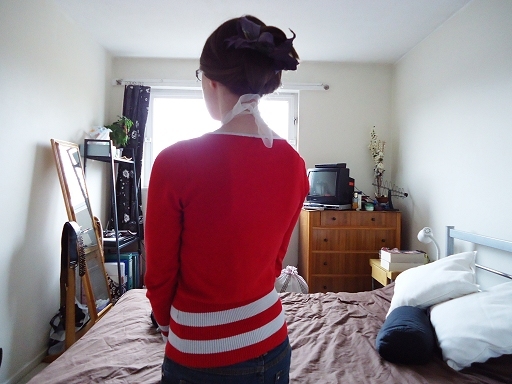 In the end, I gave up and pinned it up with a clip. I've been on a bit of an early-20th century kick. This is mostly because I've been watching too much Downton Abbey and looking at too many Edwardian photographs while at work. So this morning I found a rather nifty-looking Edwardian hair tutorial and gave it a go. It's a bit more matron than marchioness but I'm still rather chuffed with the way it turned out. Maybe tomorrow I'll try for the full Lady Mary. My Mum knitted this thing years ago. 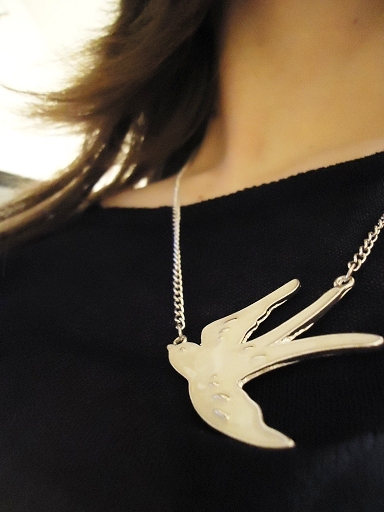 I first got it when I took it away to university with me and it's been my companion ever since (it even came to New York for six months!) There's nothing like a blanket to snuggle into when it's cold. 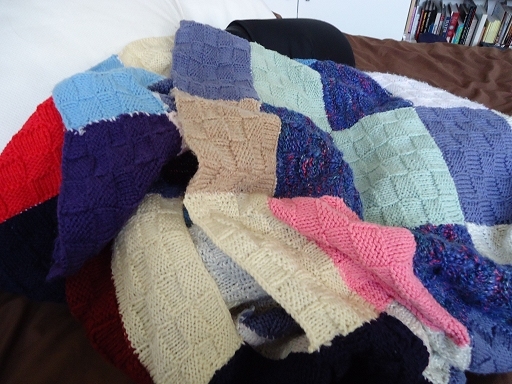 I tend to feel the cold each winter, no matter where I'm living, so this blanket gets an outing each year. Apparently my current flat is normally a warm place, but at the moment THE HEATING IS BROKEN D: So today I've been rocking it with my blanket, my hot water bottle and copious amounts of hot chocolate. It's been pretty good, all told. Hi guys. I came over all funny this morning and decided that I was going to try to do something for advent. And that something is write Sherlock themed drabbles. Whether I stick to it or not is another matter, but I think the writing practice could be quite fun. The theme for each drabble comes from the Oxford English Dictionary's word of the day. I've been consuming lots of things this week, both literally and figuratively. 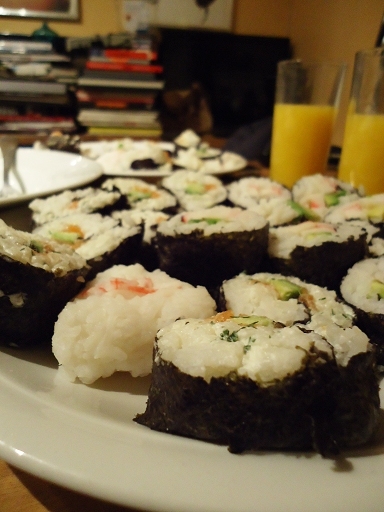 Firstly, Deborah and I attempted to make sushi yesterday. It was lots of fun even if the results didn't turn out quite as we'd hoped. (I think maybe the decision to add sour cream, dill and honey was a strange one. IT SEEMED LIKE A GOOD IDEA AT THE TIME.) But we finished the meal off with profiteroles so it was all ok.
And we watched The Third Man. I love this film, guys. The cinematography and the music and the setting of a bombed-out Vienna all come together to make something quite wonderful. For example: stake-outs are best when you have balloons. The new series of The Killing is on! Woo! Let's hope it gets as exciting as the last one, although I'm still feeling a little fraught after SPOILERS in the first series to be honest. Handy hint: You know you're looking forward to the new series of The Killing when you start singing the words 'the killing' to the theme tune of The Sweeney. Yes, I am that cool. I started reading this book about three years ago and stopped half-way through because of my anxiety. Now I've gotten over all that, I decided to give it another go. The verdict? This is a great book! Seriously good. I love the way it's written. The first-person POV is very well done and astoundingly fascinating. And the story's a pretty good yarn too. If you haven't read this book yet, go and do so. It's worth it. Also, when I started reading it before, I hadn't quite realised how many Sherlock Holmes references there were in there, which is quite surprising given the title. In fact, I didn't realise the title was a reference either until very recently (right now, I am making my 'I feel like an idiot face'). Guys, did you hear the news? January. JANUARY. Soon we will have more episodes of Sherlock and it will be A VERY GOOD THING. But, that also gives me a deadline. I am determined to have read The Final Problem and The Hound of the Baskervilles by the time the new series airs. The only problem is that I am also determined to read the stories in chronological order of publication and I've still got quite a way to go. So this weekend didn't go according to plan. It was Deborah's birthday and she'd booked a table at a swanky club in Mayfair. Claire came down to stay at mine yesterday and we toddled off to Mayfair for some fun times. Turns out though, that Claire and I were 10 minutes late so Deborah's table was full and apparently that meant we weren't allowed into the club at all; no table, no entrance. NOT IMPRESSED, SWANKY MAYFAIR CLUB. If you are going to have a super-strict entrance policy, please make it clear before people travel all the way here from Southampton. To be honest though, I wasn't that disappointed. I was sad that we couldn't celebrate with Deborah, but I wasn't really looking forward to going to the club anyway. Don't get me wrong, I like dancing, but if you're an establishment that charges an exorbitant entrance fee plus a rather ridiculous minimum spend for each table plus plus a dress code along the lines of 'all girls must wear heels and tiny dresses and nothing else is acceptable' I tend to think you're a bunch of knobs and I'd rather not waste any of my money on you. Just for the record. Anyway, all wasn't lost. Claire and I found a very nice Sicilian restaurant in the West End. We sat at the bar and drank cocktails and felt very classy. We also had a great chat, which is hard to do in a club setting. And we were finally able to meet up with Deborah this morning to give her our presents. She felt a little bad about yesterday so treated us to hot chocolate and some rather delicious muffins, which was very nice of her. So the weekend turned out rather well in the end, I think. God, I need to sleep now though; we were up cocktailing rather late last night. 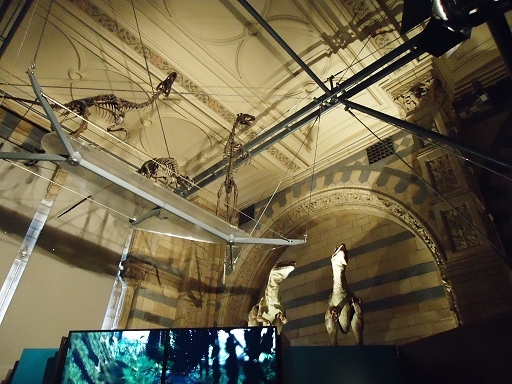 We all proved that we knew how to act our age by running straight into the dinosaur exhibition and then going to play with the toys in the gift shop. 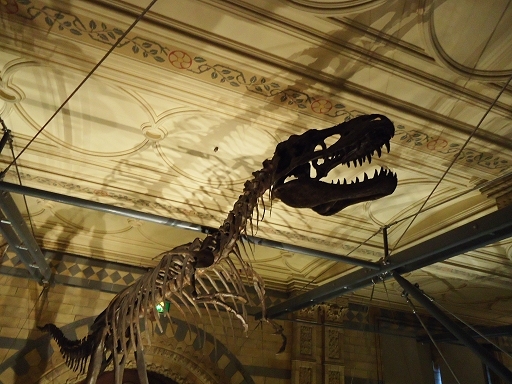 In our defence, dinosaurs are pretty cool. I loved the shadows that the skeletons threw on the walls. I think these were velociraptors? Maybe? We indulged ourselves in many Jurassic Park quotes before we realised that the film is nearly 20 years old and promptly shut up. Ok. 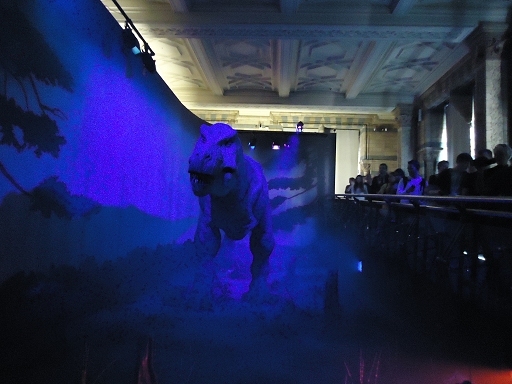 So the animatronic T-Rex is there to scare the kiddies. But, gosh, it does move well. I was scared myself. I WASN'T SCARED I SWEAR. So fascinating though. I've just been watching a programme about dinosaurs on the TV, and I've also just finished reading The Selfish Gene by Richard Dawkins. The TV show was a little low-budget and the book was a little dry, but, man, there isn't anything that fascinates me as much as evolution. Seriously. Seriously! When the book started talking about how organisms may have evolved in the first place, oh oh oh. Stuff that used to be there but isn't there now, oh my! Natural selection, oh, Mr Darwin! And I will leave my beard on. GAZE. After all that excitement, we went for lunch. 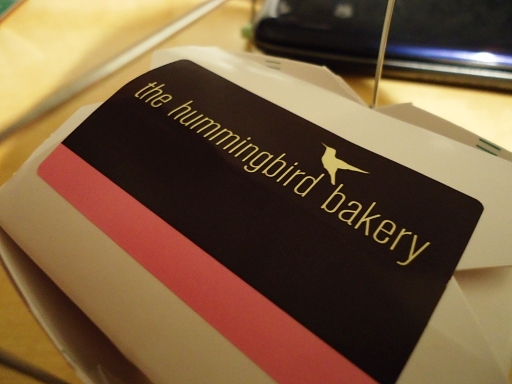 And we just happened to pass by the Hummingbird Bakery. I'd heard a lot about this place, so I decided to go get myself a cupcake. It was on the expensive side, but worth it to try it once, I say. It came in a very cute little box. 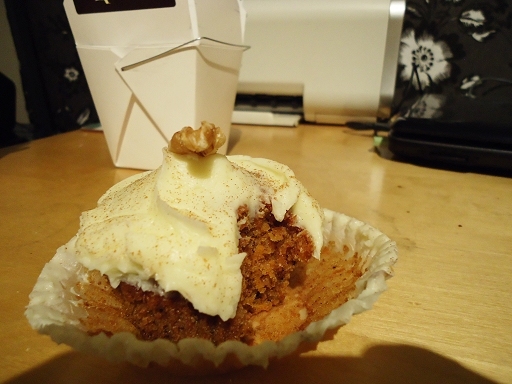 Carrot cake cupcake for me. And it was very tasty. I normally find large amounts of frosting to be quite trying, but this one wasn't sickly at all. If I wasn't a person with bills to pay, I'd go back for more! I read the above. In my opinion, it wasn't as good as The Count of Monte Cristo. Mariya begs to differ, and I will admit that it has all the fun and adventure and ridiculous storylines of Monte Cristo. But I found that the plot tended to meander a little and it was very much a boys' adventure story. Swordfights! And moustache-twirling! And deeds of derring do! For no apparent reason! Why all the fighting, guys!? Yes, maybe that's what heroes do if you live in the nineteenth century, but I can't help feeling that D'Artagnan and his friends spend most of the book wandering around acting like dicks. So much so that I was tempted to rename the book, The Three Dicks. 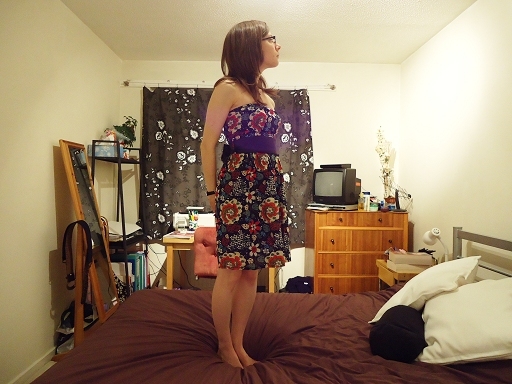 You may remember me saying that I bought a couple of dresses for super cheap but that they needed some alterations. I spent all day yesterday sewing, pricking my fingers, tying myself in knots, and lamenting the fact that I didn't have the foresight to actually learn how to do this before giving it a go. Still, I think the results are passable. Seven pounds for the two of them! (I'm sure shouting out the price makes me seem ever so classy.) SEVEN POUNDS!